Wat Rakang is on of Bangkok’s oldest temples, located on the banks of the Chao Phraya River on the Thonburi side at the center of Old Bangkok. The temple was the home of a very famous monk in the 19th Century, named Somdej Phra Phutta Acharn Toe. Acharn Toe was the first to devise the classic Phra Somdej style amulet, named after him, with its elegant simplicity and lines, showing the Buddha seated atop multiple tiers. The amulets developed a reputation for being powerful talismans against danger and are worn or simply just kept, such as on a family altar. A long line of famous monks at the temple have made and blessed the amulets since they were first created by Acharn Toe. 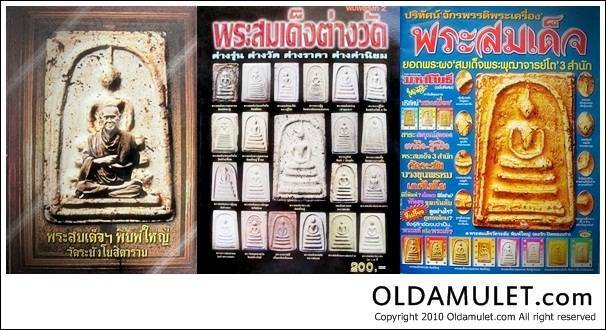 There are many new ones, but not so many really old ones with crackled or worn, mottled patinas that are so beautiful and highly desired by avid Thai amulet collectors.